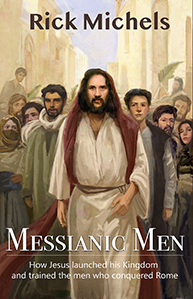 Q &A #1: Why did I write Messianic Men? Over Christmas of 1985 or 86, I had some time to kill during the Holidays.. A few weeks or month earlier, while in the Parish community hall enjoying the post Mass coffee and donuts, I had earlier picked up a free book titled The Eternal Galilean by Bishop Fulton Sheen, along with a book by CS Lewis called the Abolition of Man. The election of Ronald Reagan and the overreaction by the left had in time shaken me out of a post college left-leaning slumber. I found the conservative writings by both local and national columnists, from George Will to George Weigel and Micheal Novak (not to be confused with Robert Novak) far more persuasive when placed alongside the communist/socialist ideology so prevalent on my old campus. Free markets, free people, freedom to emigrate and freedom of speech and thought was championed in the West. Meanwhile, the power of the religious tradition of Catholicism and Orthodoxy in confronting the Soviet Empire in places like Poland and promoted as essential by dissenters like Aleksandr Solzhenitsyn, Lech Walesa and the new Polish(!) Pope John Paul II made for a powerful draw toward the belief that universal human freedom supported, sustained and defended by the Christian religion would best serve mankind. Especially appealing to me were the writings in a little journal called Commentary by Norman Podhertz and Irving Kristol. These were former leftists who by the early 60’s could no longer defend the horrors of the Soviet Union and communism and made a compelling case that the anti-communist, anti-socialist, anti-big government believers Reagan and Margaret Thatcher were right all along. So, knowing that Bishop Sheen and CS Lewis were oft quoted heroes of Christian Orthodoxy by these writers, the opportunity to pick up a couple free books by them was too good to pass up. Finding time to step away from the newspaper and magazine columns of the day, I dusted off these books over the Christmas break. Lewis’s book I found a little difficult to fully appreciate and set it aside after a bit. I then located the Sheen book, a little book on the life of Christ, and decided to give Jesus another go. It seems strange to say that, being a church attender in fairly good standing. But I found that while my enthusiasm for the Church and eternal, important things beyond the materialism Karl Marx focused on was strong, it also appeared to me that the real “opiate of the masses” was not a spiritual delusion, but rather a material one (after all, Madonna was cavorting on MTV as a Material Girl at the time). This is not to say that Jesus is a “conservative.” But rather, this is to say that an interest in Jesus (the Jesus of the New Testament anyway) will take place when one is interested in eternal (spiritual) things. Particularly, curiosity in Jesus will heighten when a person takes a special in interest in whether or not he possesses an eternal soul. This perhaps takes place more often in conservative circles for a very simple reason that has little to do with politics and more to do with whether one focuses on material or spiritual things. When the left embraced Marx’s dialectic materialism and its resultant atheism, it moved away from Jesus. Similarly, right leaning Ayn Randians, embracing what they see as non-rational religious beliefs that hinder the beauty of reason, will also move away from Jesus. Hence, my move toward considering Jesus was more based on my interest in eternal things rather than on politics. Marxist based politics has no room for the spiritual and eternal and will not facilitate a search or appreciation for such things. Having said that, it is true that a socialist who becomes one because he wishes to emulate Jesus and his preferential option for the poor, as well as the communistic live style of the very primitive Church, may also find himself open to eternal, spiritual things. A generous liberal spirit will often draw a person to becoming a believer in Jesus, following a different path to the same Jesus. It seems less likely however, and I think that has something to so with the atheism implicit in the great socialist anthem, John Lennon’s Imagine, which treats religion and a desire for spiritual things as detrimental to human happiness. Imagine does so much like Marx did (hence, perhaps Lennon indeed read a book by Marx, while rejecting violent conflict to bring paradise into being – no carrying pictures of Chairman Mao). Sexual restrictions in the New Testament tend to have a similar effect on generous souls who merely wish for fellow human beings to be happy and not judged, so long as they do not hurt others. But I digress. I had a year or so earlier picked up Bishop Sheen’s Magus Opus, Life of Christ. What I was looking for was a kind of Catholic approved version of the Jesus movement, which was a vibrant enthusiasm for the Lord that a number of friends and acquaintances I met over those years seemed to have. It was strange to me that so many of these Jesus believers displayed the fervency that the Gospels suggested was necessary and normal, yet lacked the substance my Catholic faith seemed to offer in its official version. Still, I had to admit these born-againers were indeed fervent and sincere. However, they often seemed either too shallow in character, or too disapproving of a good time (they couldn’t enjoy a stiff drink, for example). They were thus easily dismissed in my mind, until a Christian co-worker was there to help me confront a difficult situation at the job site. Seeing this born again Christian display real character instead of offering mere bible verses and platitudes spoke volumes. I realized I could never simply dismiss born again Christians as merely a shallow version of the real thing. I didn’t necessarily understand the fervency, but I couldn’t dismiss it as unserious anymore. And so, picking up Sheen’s small, simple book, The Eternal Galilean, I began to read a chapter or three each night. And as I did so, I became increasingly engrossed in the person of Jesus Christ, like never before. Somehow, Sheen had used the right words, the right stories, and the right illustrations, to make Jesus of Nazareth the most compelling person I had studied to date. After a week or so, I was completely enamored, for the first time, with the Jesus Christ I was supposedly already worshipping all my life. With such a book suddenly placing me on a path of a powerful life change, it has since then likewise long been my desire to similarly write a little book like that one: a book that would cause someone on this earth to fall in love with Jesus the way Bishop Sheen’s book did me. Why not simply give away copies of The Eternal Galilean?